The Vue™ series is a groundbreaking line of highly portable, DMX-controllable LED-fitted beam effects. 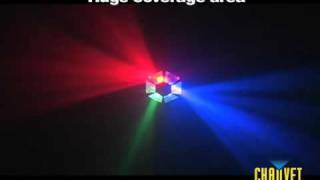 The Vue™ 6.1 rotating LED moonflower effect provides individual control of red, green and blue LEDs within each of three clusters for full-floor coverage. It offers automated and sound-activated programs via DMX and is linkable with the Vue™ 1.1. The hanging bracket is adjustable with sliding side rails. An internal sensor and Autoswitching feature automatically adjusts to the proper voltage. Considering purchasing the Chauvet Vue 6.1? Have questions? Ask people who've recently bought one. Do you own the Chauvet Vue 6.1? Why not write a review based on your experience with it. Great light. Lots of movement and coverage. Loads of built in options. Just wish it was black and not silver but overall excellent. 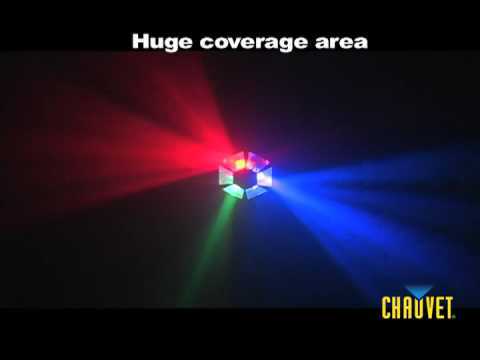 Seen a video for Chauvet Vue 6.1 online or have you own video? You will earn 556 loyalty points with this product worth £1.39, when logged in. Check out Chauvet Vue 6.1 on DJkit.com!